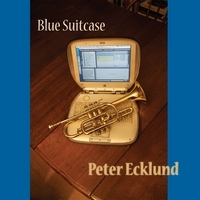 Your many readers who remain in New York for the summer may like knowing that Peter Ecklund will bring his evening of jazz standards and original music back to the Greenwich Village Bistro on Wednesday, July 8th. The program promises to be an extension of their last outing: high-class, intelligent musicianship, always swinging as expected but with a felicitous penchant for framing the familiar in unexpected ways. Mike Weatherly on bass (with the occasional vocal) and Will Holshouser on accordion will join Peter on trumpet and flugelhorn, with guest appearances by the Potted Palm Orchestra and the Music Minus One Orchestra. Wednesday, July 8th, 9 to 11, at the Greenwich Village Bistro (13 Carmine Street between 6th & Bleecker). For reservations, call 718-213-4736. No cover, no minimum. Suggested donation $5. Peter Ecklund will be appearing in a night of jazz standards and original music at the Greenwich Village Bistro on Wednesday, May 13th. The mix of material promises to be eclectic and tuneful: some Bix, some Basie, some surprises. 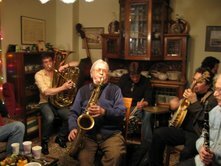 Mike Weatherly on bass (with the occasional vocal) and Will Holshouser on accordion will join Peter on trumpet and flugelhorn. Guest appearances include the Potted Palm Orchestra and the Music Minus One Orchestra. That’s Wednesday, May 13th, 9 to 11, at the Greenwich Village Bistro (13 Carmine Street between 6th & Bleecker). For reservations, call 718-213-4736. No cover, no minimum. Suggested donation $5. Visits will be in order…but first and foremost to the Bistro on May 13th!